Recently I stayed (with family) for a few days in Anoka, a northwest suburb about 20 miles outside of Minneapolis. As I had business in Minneapolis and no car to use, I took the opportunity to ride the new Northstar commuter rail line into town. 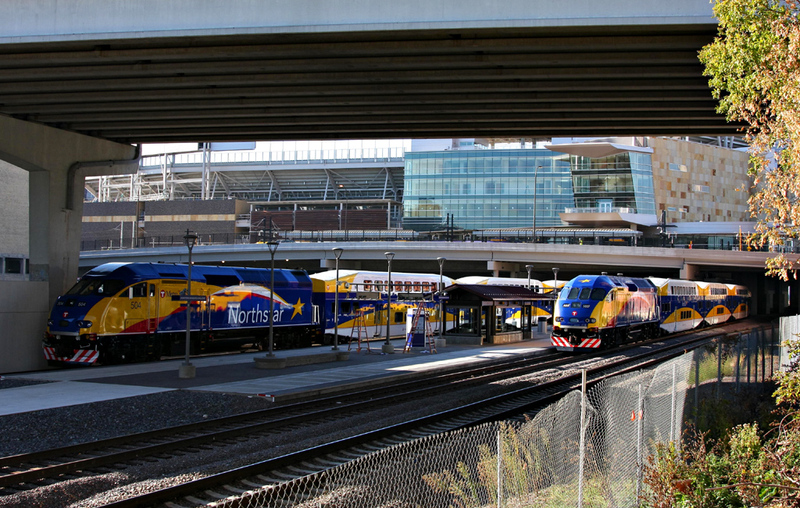 A little background on Minneapolis – it has had a successful light rail in place from the Mall of America through the airport and into Minneapolis for years. 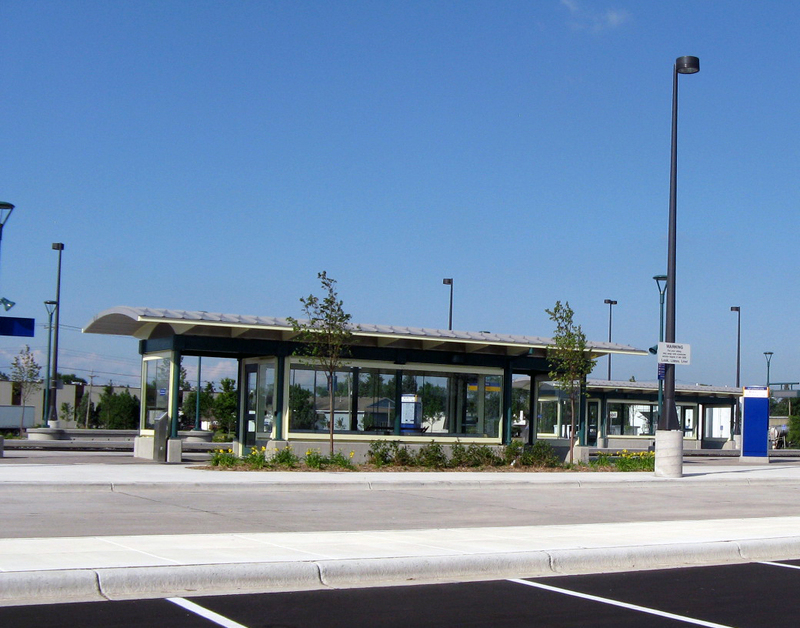 They added the Northstar Line extending from the last light rail stop out into the northwest suburbs in November of 2009 (www.northstartrain.com). The line took $320 million and twelve years to develop and mostly operates on 40 miles of existing freight track through agreements with BNSF, the owner of the track. After checking my route with their handy mobile web trip planner (www.metrotransit.com) and a short walk to the Anoka Station, I was a little early for my 7:40am train. 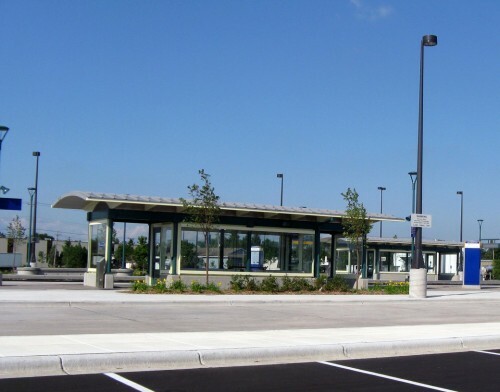 The station – while relatively convenient, clean, and welcoming, had zero amenities within a 5 minute walk. No coffee, no vending, no dry cleaners. It did have a park and ride lot to the tune of 250 or so spots which were a quarter full on this Thursday. The user interface at the ticket kiosk was intuitive and easy to use. 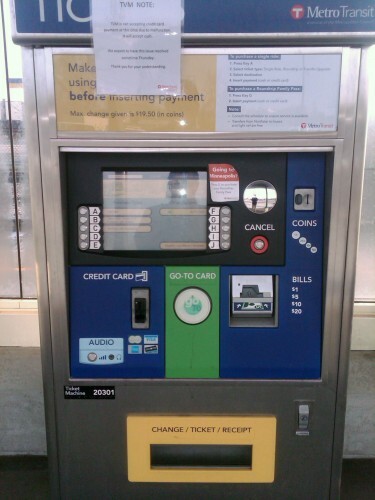 I was disappointed to find that the credit card function was not working, however, since there had been no mention of that on the metrotransit.com website. So, with a pocket full of golden dollars as change for my bills and no coffee, I waited for the train. Being Minnesota it was nice to see that heated shelters were provided, although they weren’t running on this spring morning (it was a balmy 42 degrees). The trains are large with a two story component seating about 130 people per car with three cars per engine. They are very clean and probably just past having that ‘new train smell’. 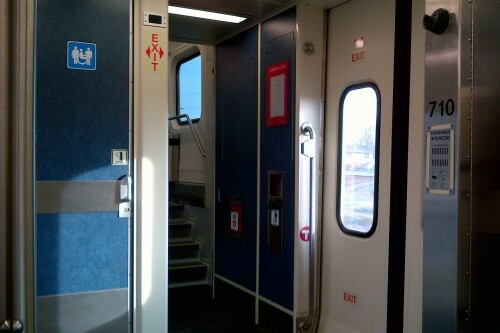 Anoka is the third stop on the way in, but I was struck by the emptiness of the seats once on board. Maybe one in every four seats was taken at that point and the train was less than half full when we arrive at the last station. While there was no wi-fi, there were bathrooms and a friendly driver who actually sang a verse of ‘Happy Birthday’ to a 4-year-old in another car. I sat comfortably through spotty cell coverage as I tried to get a jump on emails for the day. I thoroughly enjoyed the smooth quiet ride and not having to fight the automotive fight. The transfer station was built into Target Field (home of the Twins baseball team) which was a GREAT idea – tying in a destination for families for weekend ridership. Again, though, I was disappointed as there was no shop, vendors, vending machines, or stick of gum anywhere in sight. The way signage for the Hiawatha connection was clear and easy, but walking out of there would have been difficult without a map. 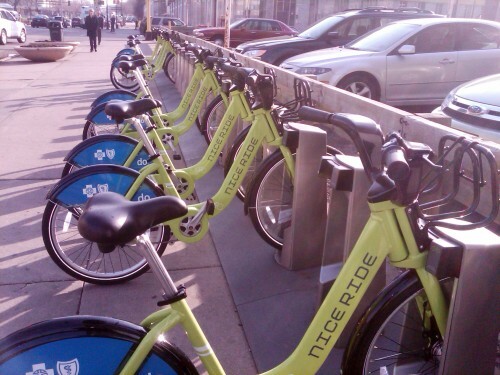 While Minneapolis boasts one of the U.S.’s largest bike share programs (www.niceridemn.com), there was not an area to get a bike at Target Field. This was disappointing as I would have enjoyed the ride outside much more than the light rail as I only had a mile or so to go. The Hiawatha was smooth and quick and I finally got my coffee during my walk along Nicolette Mall. Overall I would rate the experience as acceptable, but not spectacular. I would use it daily if I lived in the area, but that’s not about just the commuter rail. The other pieces of the transit system including the light rail, bus and bike share operate so well and frequently that making a meeting across town would not be a problem in Minneapolis. As an Indy resident, I see a lot of positives in the possibility of commuter rail for us. I also see some bumps in the road. The Northstar was the product of and addition to a destination-oriented transit and a reliable mass transit system was already working. In its first 18 months, its ridership has been slightly below expectations. There are improvements to be made and I have little doubt that ridership will grow there, but it begs the question: Can a more conservative town like Indy expect to start with a commuter-oriented rail with all of our existing transit issues and expect it to flourish? I just don’t know. Editor’s Note: Ben Houle (@IndyUrBen on Twitter) is an Indy-area native who works as a Civil Engineer for Woolpert, Inc. He is also involved locally with Habitat for Humanity and the Midtown Initiative. That may be the easy answer, but can Indy put together a destination-based light rail and improved transit/bus system enough to make a diference and help conference business, our image, low income bus travelers? I think the answer there is a resounding ‘yes’. Transit is only going to become more important as energy prices rise and the City’s investment in the convention center, stadium, and hotels are realized. We could put together such a program, but unfortunately “IndyConnect” isn’t it. You gotta start somewhere, and when it comes to Indy, any public transit project should be welcomed. However, I am afraid that building a commuter-oriented rail first would derail other more needed projects (like DT-BR streetcar line…maybe if I keep repeating it…:). I just don’t think the commuter line would attract impressive ridership and considering the general lack of awareness and support for public transportation, whatever mass transit project gets build in Indy, it better be very successful. I vote for a destination based light rail line. Say, Broad Ripple to DT? But I won’t quibble. One would run close enough to my house, and the other my office. One would make my house worth more, and the other would make my job easier. Either one, with improved IndyGo bus service, would encourage me to leave my car parked a lot more. I agree. You could put the line in either place and it would be a good start. And either would make the other much more likely than a commuter line out to suburbs. I vote for a line that serves Indy residents who would actually use it first: BR-DT. Secondly, Airport to DT for the convention/sporting event goers. These 3 lines would stimulate a more efficient Bus Transit system more than anything in Indy. We need to stay away from Fishers and Noblesville—unless those residents want to pay(NOT PAVE) their way downtown. You’re on to something, Micah: trade/use a lane of I-69-465-70 ROW for the commuter rail! Not putting in a line to downtown from the airport when it originally opened was a huge missed opportunity. So many other cities offer easy and affordable rail service from their airports to downtown. If option A or B were built first, there would be a 20 year delay in developing the Indy community. – the Airport would build the line out of their facility to a new planned rental car area and then along Washington to the West side of 465 – it is in their Land Use Plan and actually could make the redevelopment of their land a viable and exciting option for employers. – the investment could be proposed as a protection of the investment we’ve already made in the Conention Center, Luas Oil, JW, etc. I would personally LOVE the BR-DT option, but the rest of the counties and the surrounding counties would never support it as the first step and the ridership would still struggle. I refute your arguement that people who live in Broad Ripple want low density. Using that logic, people who live in Fishers or Carmel want even LOWER density so it makes even less sense to create a train route that serves said lower density.